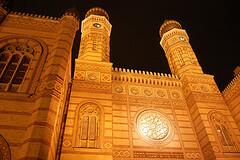 The Great Synagogue in Dohány Street, also known as Dohány Street Synagogue is located in Erzsébetváros, the 7th district of Budapest. It is the largest synagogue in Europe and the second largest in the world. It was built between 1854-1859 by the Neolog Jewish community of Pest the synagogue has a capacity of 2,964 seats. Theodore Herzl's house of birth was next to the Dohány street Synagogue. In the place of his house stands the Jewish Museum, which holds Jewish Religious and Historical Collection, built in 1930 following the synagogue's architectural style and attached in 1931 to the main building.